Drawing on extensive, broad-based, and well-designed research, as well as telling stories and anecdotes, Beyond Megachurch Myths focuses on the diversity of churches within and dispels popular myths about the megachurch phenomenon. Defining a megachurch as a Protestant church that averages at least 2000 total attendees in their weekend services, Scott Thumma and Dave Travis reveal what these churches are and are not, why they are thriving, what their members say about their experiences, and why they have many valuable lessons to teach smaller churches. 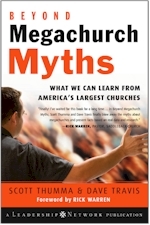 Beyond Megachurch Myths is filled with practical insights and suggestions for pastors and leaders of other church organizations that can be applied to their own organizations and ministries no matter what their size. This book is available by visiting Amazon. Read the 2005 Summary Research Report of the initial findings. "Finally! I've waited for this book for a long time.... In Beyond Megachurch Myths, Scott Thumma and Dave Travis finally blow away the myths about megachurches and present facts based on real data and research. This book helps answer some of the most common misconceptions about megachurches. The underlying research confirms what I have been saying about the overlooked strengths of megachurches and what they can teach churches of all sizes." "Crow is not my favorite dish to eat, but as this book points out, I’ve had to eat one of the myths so artfully debunked by Travis and Thumma. This book is the most definitive work done to date on the mega church." "Packed with myth-defying information from two long-time observers of megachurches, this book offers an important assessment for anyone who is curious or concerned." "This is the best available overview of the megachurch phenomenon. Thumma and Travis use several types of evidence to assess the conventional wisdom about megachurches, qualifying that wisdom when appropriate and challenging it when necessary. In the end, megachurches emerge as more diverse than many assume them to be. Anyone who wants to understand the nature of that diversity should read this book." "If the word “mega-church” sounds frightening, impersonal, compromising or worse, then this book may be for you. Dave and Scott project a factual inside view and do a great job of demystifying the large church movement in North America." "Everyone has questions about megachurches such as “Why is their number growing, How long will they last,What happens after the current Pastor’s tenure? And many more. Dave Travis and Scott Thumma will be your Lewis & Clark as you explore all things megachurch in Beyond Megachurch Myths."